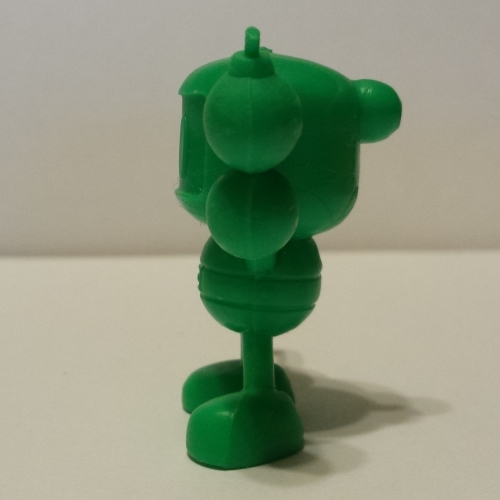 Today, I’m focusing on the Super Bomberman keshi line. 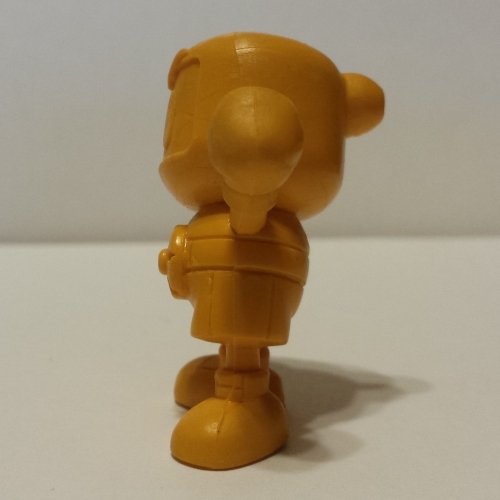 You can tell these are old because unlike other Bomberman keshi, they don’t represent any specific characters. 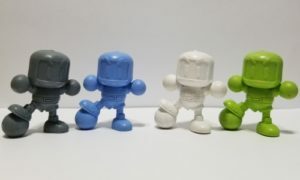 Rather than produce keshi of any of the obscure, one-off humans, they went for generic sports-themed Bombermen – and to be honest, I can’t really blame them (even though I’d love to have figures of Karat Diamond and Dr. Mook). 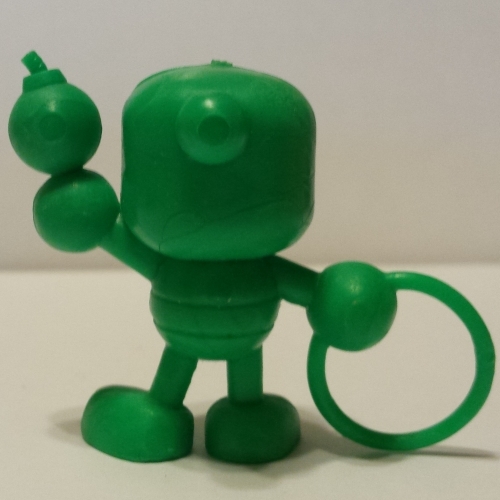 This set has a whopping total of 12 figures, each of which came in at least 8 colours. 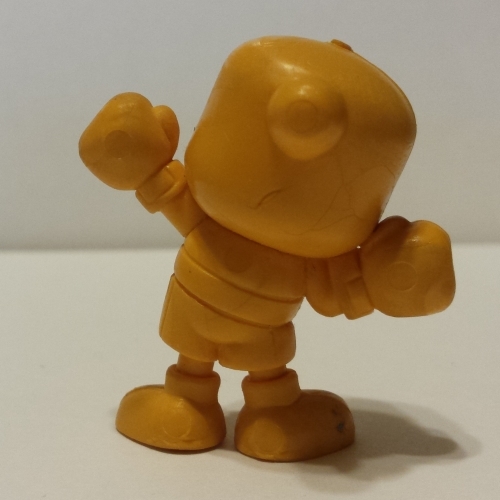 They’re among the more common keshi you’ll find for sale online, but it’s still tough to get a complete set of them. Because they don’t represent any real characters, from my experience, it seems like they are less popular than keshi of other characters. This rarely seems to impact their price, though. Please note that all names are unofficial and should only be taken as descriptors! 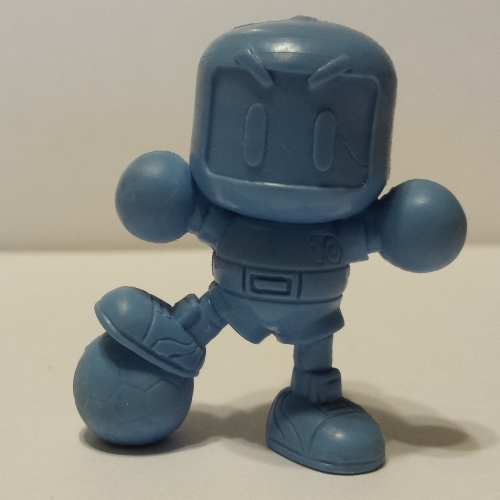 Something you’ll notice about this set is that the characters are wearing appropriate attire for their sports, so only one of the figures has the basic Bomberman body. It’s a nice touch that keeps the set from becoming repetitive. 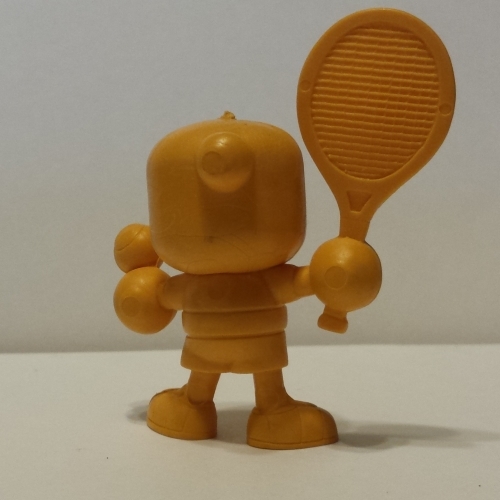 This guy is holding a tennis ball and racket. The racket is flexible, but it’s not too flimsy. 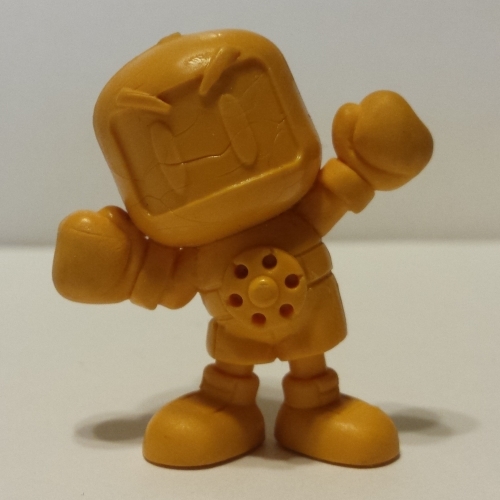 …Maybe a year or two ago, I’d wanted to write up an article about missed opportunites for Bomberman games. 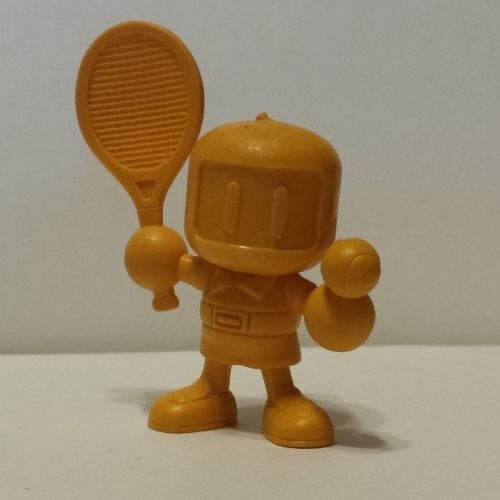 I feel like a Bomberman tennis game could have been really neat if they’d incorporated bombs and other Bomberman mechanics into it. Hmm… What do you think? 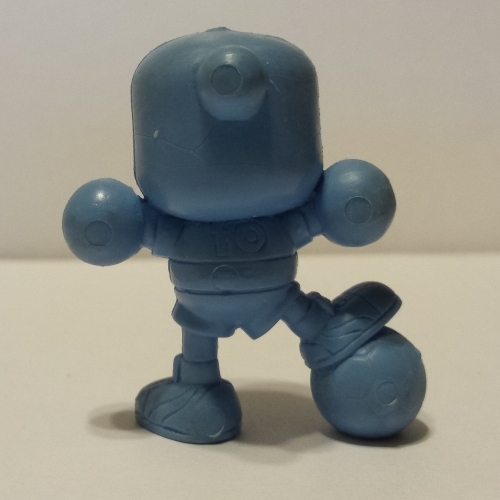 It’s Bomberman with a football (or soccer ball). He has a little “10” on the front and back of his jersey. I don’t know if there’s any significance to that. Something to note here is the face. 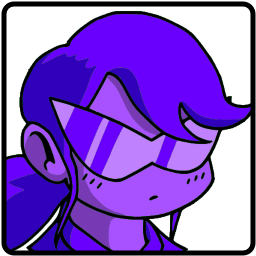 If you look at the shape of his eyes and eyebrows, it’s very similar to the official art style of Super Bomberman. 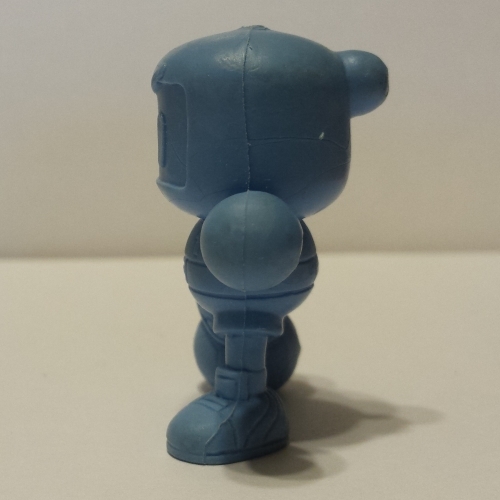 Compared to the style of face seen on Bomber Kid in the Super Bomberman 3 set, these eyes are more rounded and closer together and the eyebrows are a bit shorter (and also closer together). 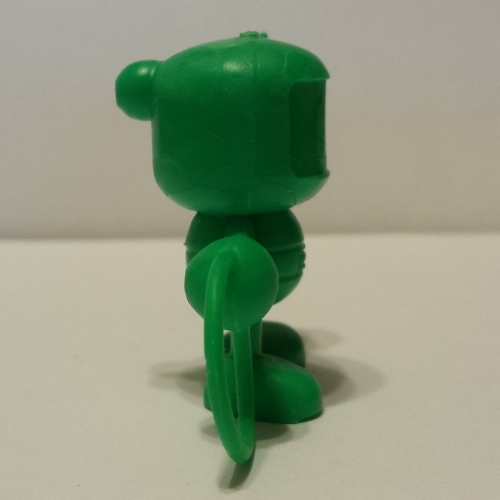 Interestingly, the shape of the visor and all other features on these figures remained consistent throughout the later sets. These Bombermen have some balls! Because of the football under his foot, it’s very easy to topple him by accident. This one actually kind of ties into the game, given the distinct appearance of the Punch power-up (displayed as a boxing glove). 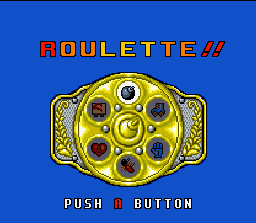 His title belt kind of reminds me of the roulette wheel, though that was in Super Bomberman 2. Also, that scar across his face isn’t supposed to be there – mine was just damaged at some point in the past – but I guess it kind of fits! 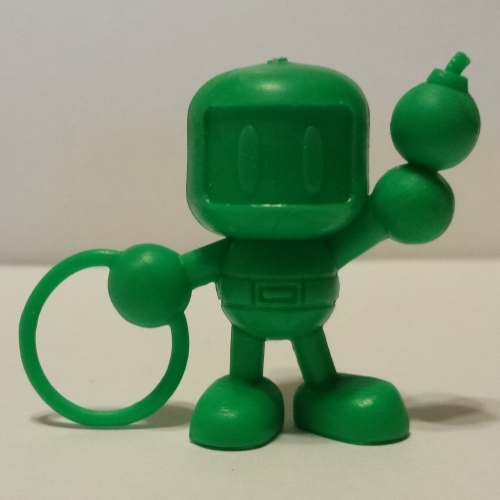 It’s Bomberman with a bomb and a hoop! I suppose the bomb is meant to be thrown through the hoop. I’m not sure if there’s any specific sporting event (or children’s game?) that this is meant to evoke; please contact me if you know anything. 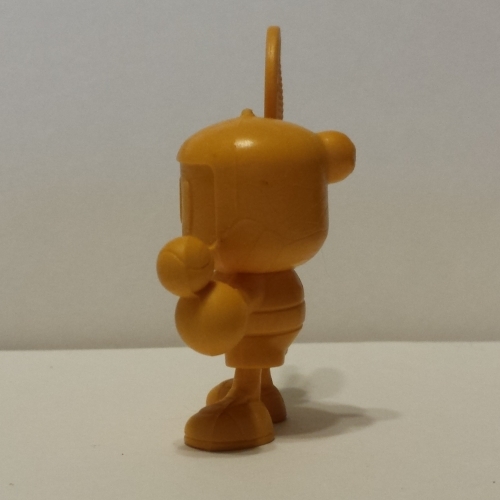 What’s notable about this figure is that he’s the only one in the set to have a completely generic Bomberman body. 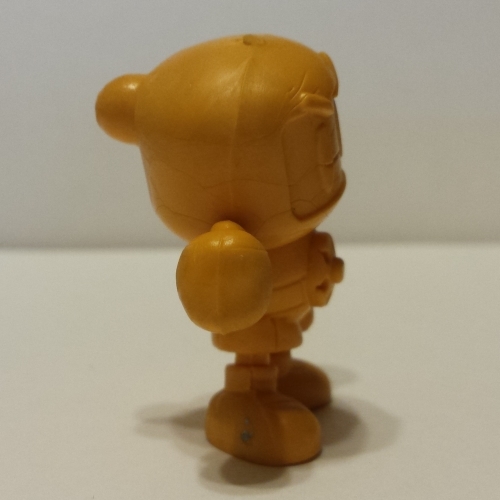 Also, strangely, the bomb is just a little bit flatter from the side than from the front. 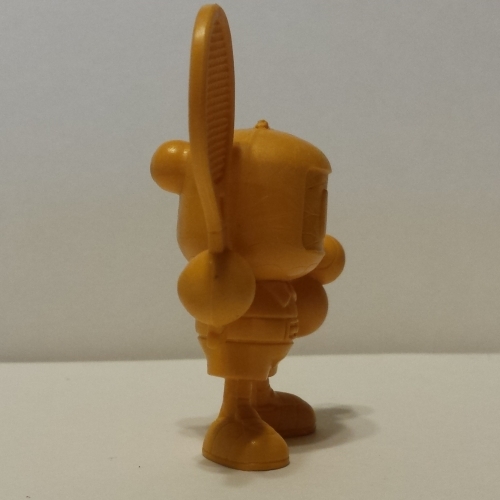 This is the case with the tennis ball as well. It’s barely noticeable, though. 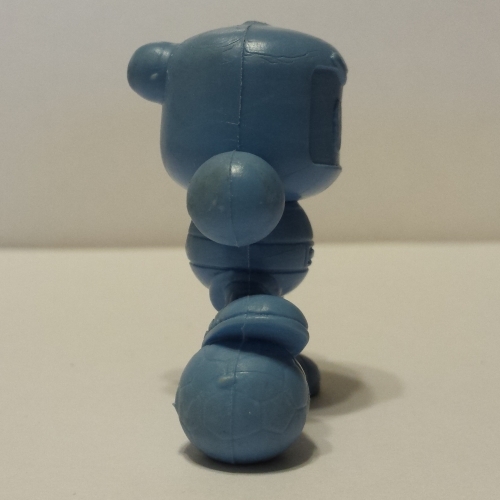 This is the case with most other small balls in this set; it appears to be related to the manufacturing process rather than the sculpts themselves.